Greenpeace, upset by what it calls Hewlett-Packard's "backtracking" on commitments to build greener tech gadgets, today sent a very large message to HP management. 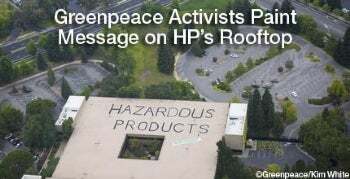 Activists from the international environment group painted the message "Hazardous Products" on the rooftop of HP's global headquarters in Palo Alto, Calif. Greenpeace also sent automated phone calls from actor William Shatner (yes, Captain Kirk) to the company, urging it to phase out toxic chemicals in its products. "Earlier this year, HP postponed its 2007 commitment to phase out dangerous substances such as brominated flame retardants (BFRs) and polyvinyl chloride (PVC) plastic from its computer products (excluding their server and printer lines) from 2009 to 2011," said Greenpeace in a statement. A statement on HP's Website promises to phase out BFR and PVC in its personal computing products in 2011. PVC, also known as vinyl plastic or polyvinyl chloride, is often used to insulate electrical cables. It can form dioxin, a carcinogen, when burned. BFRs, or brominated flame retardants, are often added to plastics in electronics products. They don't break down easily in the environment; can be released from products during use; build up in humans and animals; and can harm the hormone and immune systems. Greenpeace rates the environmental efforts of major tech companies in its quarterly Guide to Greener Electronics, a report card that rates the firms on a 10-point scale. Its March 2009 report blasted HP, Lenovo, and Dell for backtracking on earlier promises to eliminate PVC and BFRs by the end of 2009. "It's shameful that HP is continuing to put hazardous products on the market, despite the promises it had made," said Greenpeace's Casey Harrell in a statement. "Instead of going back on its commitments, HP should be following the lead of companies like Apple, which has led the sector in phasing out these toxic chemicals." Greenpeace's aggressive tactics may turn off a lot of people, but they do get results. In 2006 the group launched an all-out PR war on Apple, which at the time was using PVC and BFRs in many of its products. Fast-forward to 2009, and Apple's new computer lines are virtually free of these toxic chemicals. While Cupertino didn't exactly play nice with Greenpeace, there's little doubt the environmental group's constant badgering had an impact on Apple's green policy. It remains to be seen, however, if Greenpeace has the same influence over HP.